Although Weng-Keen Wong was born in Malaysia and has lived in the US since he moved here for graduate school, he will always be a hockey-loving Canadian. His parents moved from Malaysia to Canada when he was seven, hoping for better opportunities for their children — a plan that worked out pretty well, he says. In addition to learning to play hockey there, he developed a curiosity about how people learn and whether it can be applied to computers. His interests eventually led him to Carnegie Mellon University where he received his PhD in Computer Science. “I think machine learning is the coolest things in computer science, and I’d really like to see more people using it,” he says, explaining that he seeks out novel collaborations with scientists across a variety of disciplines including public health, ornithology and genetics. Students, colleagues, and friends are likely to encounter Weng-Keen Wong's other passion — cooking. “I like to find important problems in other fields that also lead to new contributions to machine learning,” Wong says. For example, in graduate school he worked on a project developing algorithms to detect disease outbreaks. A current project aims to link bird species with environmental features such as temperature, precipitation, and land use, which he says is an example of how computer science can help solve really important environmental problems facing the world today. 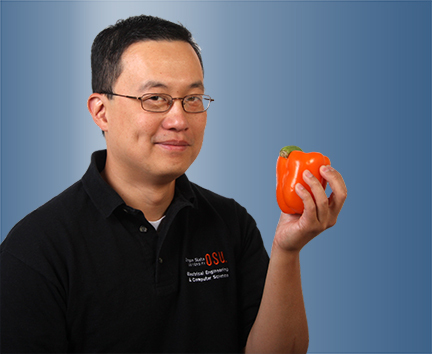 Another of Wong’s research interests is anomaly detection — looking for unusual but interesting data points. Detecting anomalies can be important in scientific discovery as well as applications such as surveillance systems. His enthusiasm for his work extends beyond the lab and into the classroom. He says it is fairly easy to capture the imaginations of students with the exciting advancements that have happened recently in artificial intelligence, such as the Jeopardy game in which the super-computer, Watson, defeated two previous champions. But he also tries to make classes fun with assignments like creating a maze solver, or using movie scenes to illustrate computer science principles. One of his favorite scenes is from The Princess Bride where the hero, Westley, challenges the criminal genius, Vizzini, to choose one of two glasses of wine — one of which Westley has poisoned. “That is actually is a beautiful illustration of game theory in which your opponent has some hidden piece of information, like in poker,” he explains.